So, what's stopped me from posting anything from Kitchens of Distinction? This probably has to do with the fact that most of their catalog is still available - but then I remembered...b-sides. Truthfully, I'm sharing this for the a-side, the sublime "Drive That Fast," which had me enamored from the word go, almost thirty some years ago now. 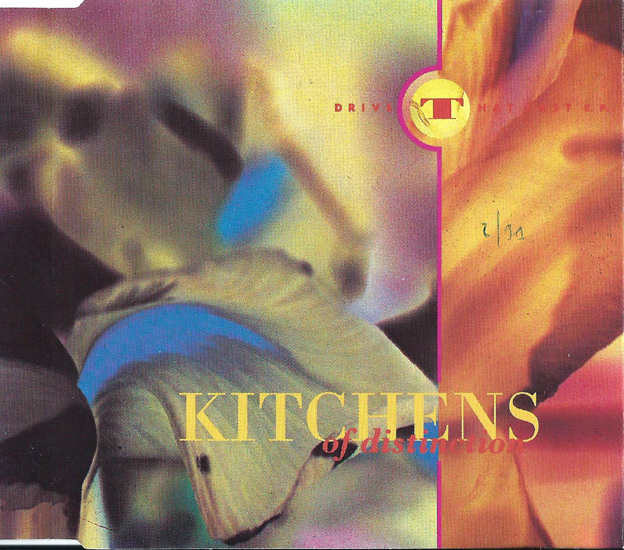 Alongside Swervedriver's "Mustang Ford," The Kitchens brought the car song to dream-pop, though I would venture to guess neither band had that particular end in mind. Patrick Fitzgerald's caterwaul/croon gracefully sits atop a bed of Julian Swales atmospheric, chiming guitars, sounding nothing short of ripped from a primo Cocteau Twins record. In fact, nothing off the band's subsequent LP, Strange Free World could quite rival it, but nonetheless manages to stand as their finest hour. "These Drinkers" pursues a similar sonic template, albeit Fitzgerald is content to talk (not rap) on this one, and he doesn't show up on the mic at all for the long-winded but pleasant instrumental "Three to Beam Up." "Elephantiny" is a starker piano-laden piece, recalling what I loved so much about those Epic Soundtracks solo records. The Kitchens washed their final load of dishes in 1996, but reemerged in 2013 for a reunion record, Folly. The CD copy I owned of Strange Free World has the lyrics of "These Drinkers" along with the 10 other songs, but the actual song is nowhere to be found. And I agree with the Epic Soundtracks similarities in regards to "Elephantiny," although the instant I heard the full band uptempo version, I vastly preferred that. The one Kitchens release that always eluded me was the 2 track single they put out as "Kitchens OD" on Fierce Panda in the UK. Most of those songs, barring the Drive That Fast 7" edit, are available on the Watch Our Planet Circle six CD boxset, which is pretty good except for a very obvious mastering error on 'Prize' on the Love Is Hell disc. Preferred the next album, Death of Cool, myself, but each of the first three KoD albums is great.